There are many things that will make this a great experience including the interesting variety of included shore excursions and the great swaths of color you will observe while riding past the bulb fields. 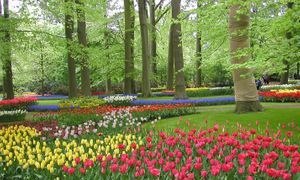 But the highlight of your trip may be Keukenhof Gardens. This is surely one of the world's most spectacular gardens--70 acres of pure floral bliss! It is only open March through mid-May each year because the focus here is spring-flowering bulbs--tulips, daffodils, hyacinths, and crocus, plus others--millions of them! In addition to Keukenhof, you will have an opportunity to visit Floralia, a 34-acre flower show where more than 1 million bulbs surround a beautiful castle with perfectly manicured gardens and walkways. After the cruise, you may opt for a two-day extension in Amsterdam that will allow you to experience more of Amsterdam's remarkable attractions on your own. The extension will include an excursion to the Aalsmeer Flower Auction, the world's largest floral market where around 20 million flowers are traded every day. This hive of activity takes place in the 4th largest building in the world and is a sight that nearly defies description and one that you will never forget. We will also be working to make at least one optional floral demonstration or workshop available to those who are interested. Please take a look at the itinerary and the attached brochures and register before April 30, 2017 in order to receive a $750 per person discount on your cruise. For more information, contact Mary Ann Bryant, NFA Tours Chairman at maryannbryant1@gmail.com or 770-893-1570.